These are lyrics by Alice Cooper that we think are kind of funny. 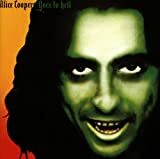 Alice Cooper's, "Department Of Youth"
A group of kids is singing about having the power. Alice expects them to answer his question with 'Alice!' but instead they say Donny Osmond. The most honest song lyric in rock and roll history...even though there is possibly a double-meaning in the first line listed here.